Installing new concrete for a pool deck, patio, or driveway? Want to give existing worn concrete a much-needed facelift? Our stamped concrete in Alexandria, Virginia is a cost-effective and beautiful way to transform boring gray concrete into something stunning. Our textured concrete solutions can give you the look of a wood pool deck, cobblestone driveway, or herringbone paver patio for a fraction of the cost. The final product is a very close replication of other, more expensive building materials like natural stone, brick, or flagstone. Sometimes known as imprinted or textured concrete, stamped concrete is a cost-effective solution to get the look of wood planks or paver stones in a concrete slab. The stamped concrete technique can be used to add texture, color, and patterns to any slab of concrete, including driveways, pool decks, patios, and interior concrete floors. 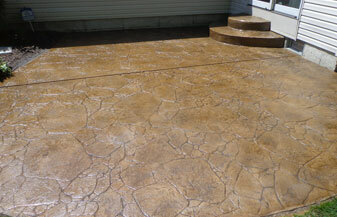 Stamped concrete is created with a multi-step process. When the concrete is poured, a base color hardener is added. This powder pigment dyes the concrete and may be added with an integral color to the entire volume of concrete or as a cast-on color on the top layer of the wet concrete. Color release is also added to the concrete on the surface as an accent or secondary color. A pattern will be stamped on the concrete before it fully sets. This pattern will be a realistic duplicate of the look you want, such as brick pavers, flagstone pavers, or wood planks. Today’s polyurethane concrete stamps can very closely create the texture and look of natural stone or wood. While stamped concrete can be easily achieved with new concrete slabs, it can also be created with existing concrete thanks to concrete overlays. This involves adding a new layer of concrete on an existing slab and coloring and stamping it to achieve a new look. Not sure if you should invest in stamped concrete walkways and patios? Textured concrete comes with many advantages, especially when compared with other building materials. Here’s why homeowners in Alexandria, Virginia love the look and feel of imprinted concrete. Love the look of herringbone pavers, wood planks, or cobblestone but hate the high cost of installation and maintenance? With stamped concrete in Alexandria, you can get the look of high-end materials for a fraction of the cost. Stamped concrete can look just like wood planks, brick, or costly pavers with complicated patterns yet it costs just a bit more than slab concrete. It also comes with low maintenance costs because it’s as easy to care for as a regular slab of concrete. Some materials may look beautiful but come with high maintenance needs, especially wood pool decks and patios. Stamped concrete requires almost no care, just like regular concrete. It maintains its pristine appearance and color for many years to come without worrying about mildew, splinters, wood rot, or weeds growing between paver stones. Get the look of wood, brick, or pavers with a long life. Stamped concrete lasts just as long as regular slab concrete, which is around 25 years or even longer. Your stamped concrete patio, driveway, or pool deck will last for decades with almost no care or repairs necessary. Stamped concrete is a versatile option that can be used for interior and exterior concrete. Our stamped concrete contractors can install beautiful stamped concrete floors, walkways, patios, and more. Here are the most common uses for stamped concrete in Alexandria, Virginia. Stamped Concrete Driveways. A beautiful paver driveway can dramatically improve your home’s curb appeal and value. 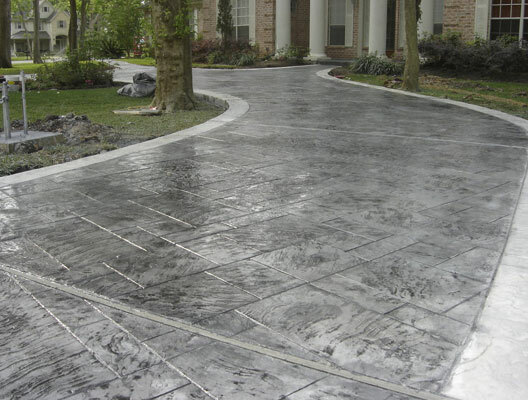 Get the show-stopping look with a gorgeous stamped concrete driveway. Stamped Concrete Pool Decks. Want a beautiful wood or paver pool deck without the high cost? 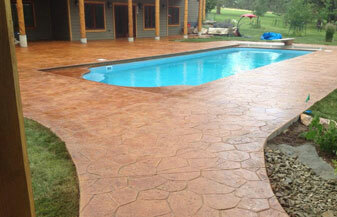 A stamped concrete pool deck is a long-lasting, safe, and eye-catching solution. Stamped Concrete Walkways. 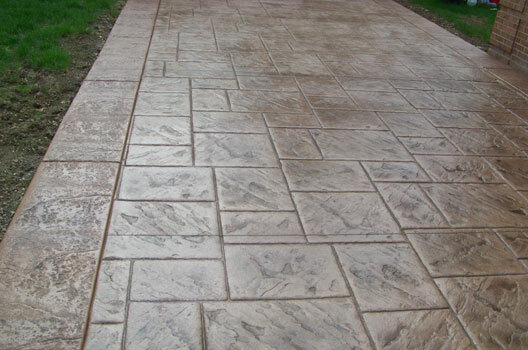 Dress up bland walkways and add a slip-resistant texture with our stamped concrete walkways for your home or business. Stamped Concrete Floors. Say goodbye to boring, gray interior concrete floors. With stamped concrete floors, you can update your basement, garage, laundry room, and other living spaces with beautiful texture and color. Questions for our stamped concrete contractors in Alexandria? We are just a phone call away! Here are a few frequently asked questions we hear from homeowners and business owners. Please reach out if you have additional questions. Can stamped concrete go over my existing concrete? Absolutely! A stamped concrete overlay in Alexandria, Virginia is a cost-effective and easy way to update the look of your existing concrete. We can add a new concrete layer onto your existing slab and create the look you want with special concrete stamps. 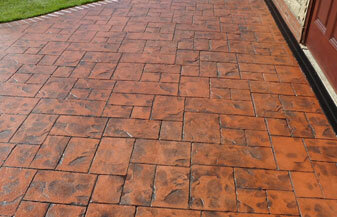 A stamped concrete overlay is a convenient way to get a new look for your patio, driveway, pool deck, and walkways. Will it crack, and can it be repaired? While all concrete eventually cracks, stamped concrete is a durable concrete solution that’s highly resistant to cracks when professionally installed. Most cracks will be very tiny and hidden within the pattern, texture, and color of the stamped concrete design. If your stamped concrete develops more serious cracks, repairs are possible. Why do people choose stamped concrete? Homeowners and business owners turn to stamped concrete for many reasons. It’s an economical solution to update the look and feel of existing concrete, including pool decks, patios, driveways, and interior concrete floors. It offers a very long life and almost no maintenance, just like regular concrete slabs. It can also be used to get the look of high-end materials for a fraction of the cost. If you love the look of natural stone, slate or flagstone stamped concrete can get the look for just a bit more than regular concrete. Want a paver patio with a complicated (and expensive!) pattern like herringbone or European fan? 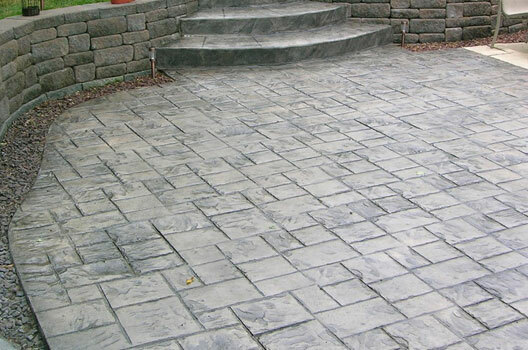 With stamped concrete pavers, the look is easy and fast to achieve. We work hard to make sure your dream patio comes true. Virginia's most trusted concrete patio company.